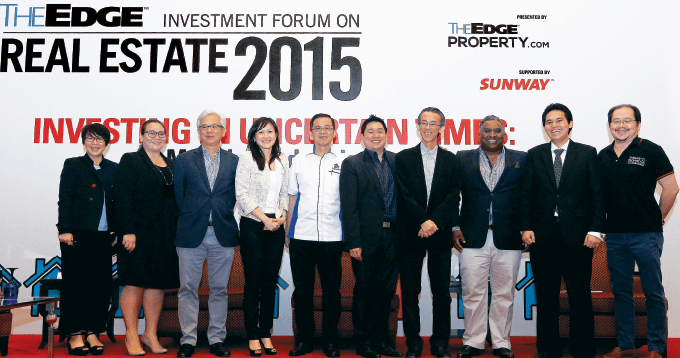 THE ninth edition of The Edge Investment Forum on Real Estate saw more than 750 participants turning up on the cloudy Saturday morning of April 25 to listen to the experts talk about the property market and where it is headed. With a real estate landscape that was reeling from the impact of Bank Negara Malaysia’s responsible lending policies, the removal of the developers’ interest bearing scheme (DIBS) and the recently implemented Goods and Services Tax (GST), it was apt that the forum’s theme was “Investing in Uncertain Times: Make Better Decisions”. The Edge Media Group publisher and CEO Ho Kay Tat said in his opening address that “two years after cooling measures were introduced by the authorities, one can see the property sector has been in a stage of uncertainty and many people are confused”. Homebuyers and investors are thus holding back on buying or selling, he added. Ho also spoke briefly about the new and improved theedgeproperty.com portal that not only features property news and other information but also an analytic component to help investors make better decisions. The first speaker to take the stage was Zerin Properties Sdn Bhd CEO Previndran Singhe. In his presentation, “Market Outlook — What to Expect in 2015”, he gave participants an insight into the property market, stressing that it was not in dire straits and will normalise in the second half of the year when Malaysians have adapted to GST. The normalisation will be supported by “good global performance, Malaysia’s positive gross domestic product, low unemployment rate, progression of the Economic Transformation Programme (ETP) projects and multiplier effect of the large infrastructure projects like the improvement of public transport and new highways”, Previndran noted. Previndran said the primary market will see more launches in the coming quarters as developers unveil new projects to capture pent-up demand. Next on was the dynamic father-and-son duo from Ho Chin Soon Research Sdn Bhd — chairman Ho Chin Soon and CEO Ishmael Ho — who presented “Property Hot Spots — Heating Up or Cooling Down?” They focused on Penang, Iskandar Malaysia and Greater KL, saying basically that the hot spots will be where the infrastructure is. They highlighted Penang’s cable car system Sky Cab, which will stretch 3km from Butterworth to George Town, and mentioned the 17.5km LRT that will run from Komtar tower to the Penang International Airport. Both these projects augur well for Penang, they opined. On the mainland, remarked Ishmael, Eco Marina Development by Eco World Development Group in Batu Kawan is a spot to watch. On Iskandar Malaysia, Chin Soon provided information on the potential MRT stations in Johor that will be linked to Singapore. He singled out Tanjung Puteri, Bukit Chagar and JB Sentral as potential sites for the stations. This, they both asserted, will impact the properties around the stations positively. As for identifying hot spots, Ishmael said one of the key aspects is travel time to and from work, which is ideally between 20 and 30 minutes. He also noted that the rent for properties located within a 500m radius of LRT routes is generally 20% higher than that for those located further. Revealing that the realigned MRT Line 2 in Greater KL will no longer pass through the Cheras area but the Sungai Besi/Bandar Malaysia area instead, the duo said the hot spots will become clear once the final alignment is revealed after the three-month public objection period that starts this month. The final speaker before tea break was The Edge Media Group executive chairman Datuk Tong Kooi Ong. He spoke on “Democratising Property Investments”, highlighting how the world was going through some unique times with interest rates falling globally and the ongoing currency war. He opined that near-accurate information at one’s finger tips was vital to make good investment decisions. Thus, democratising property information was necessary. “There is always an opportunity to make money in the property market but for now, you need it to be more ‘democratising’. It means you have to be able to access information and analyse it to find opportunity out there,” he said. Tong then introduced the new theedgeproperty.com portal, which not only provides property news and updates but also an analytic component for users to see the fair value of their property or properties in a particular area based on past transacted prices. After the tea break, the participants took their seats for the panel discussion on “Post-GST — The Real Impact on Buyers”. The panellists were Sarena Cheah, Sunway Bhd’s managing director of property development division for Malaysia and Singapore; Datuk Soam Heng Choon, deputy president of the Real Estate and Housing Developers’ Association Malaysia (Rehda); and Dr Gerard Kho, CEO and president of Reapfield Academy Sdn Bhd. The moderator was The Edge Communications Sdn Bhd managing director Au Foong Yee. Cheah remarked that pricing would be a challenge for developers as they experienced higher cost of inputs and margin compression pressure from GST. To counter this, Cheah suggested, developers should stick to the basics, which is to provide strong products in solid locations with competitive pricing as there will always be demand there. “The key is to be able to offer value to our purchasers, whether it is in terms of product attributes or in financial return prospects,” she stressed. He also observed that GST will lead to increased cost of properties and general consumption but in the long term, this will be offset by consumers’ income and savings rising at an accelerated rate. This is thanks to the rise in urbanisation because of the government’s ETP projects, which will attract three million Malaysians to the cities. He explained that the penalty for general offences pertaining to GST was two years of imprisonment with a fine of RM30,000; for incorrect submission, it is three years of imprisonment and a fine of RM50,000; and for evasion, it is seven years in prison. With developments unable to claim input tax, property prices will increase, Soam said, adding that even it there was a lot of supply, if there was no demand, developers could not raise prices. 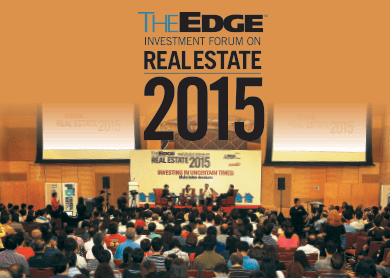 The Edge Investment Forum on Real Estate 2015 ended on a positive note as several participants noted its usefulness and left better informed about the property market and its direction this year.